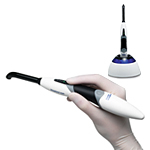 Ivoclar Vivadent introduces the Bluephase® Style LED Curing Light, the only LED curing light with Polywave™ technology—to cure all dental materials. Bluephase Style® uses two different LEDs to provide a broadband spectrum of 385 to 515 nm that effectively cures all dental materials on the market today. No other LED curing lights offer this innovative Polywave™ technology.